I will, stick my hand in a box of bugs, eat only broccoli for a day, or hand a grumpy mildly venomous snake. I will handle a grumpy mildly venomous snake. I will stick my hand in a box of bugs. Voting has closed. The winning challenge is I will stick my hand in a box of bugs..
Levi is raising money to support the Southern Corroboree Frog. Voting is now closed. Levi's pledge is closed for voting, but you can still support Levi and the Southern Corroboree Frog by making a donation using the 'Make a Donation' button above. 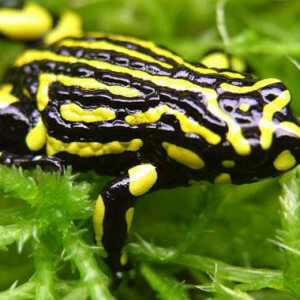 Levi has pledged to complete the most popular challenge — I will stick my hand in a box of bugs..
Help Levi raise money for the Southern Corroboree Frog. Dianne rosky gave $30 and voted for I will stick my hand in a box of bugs. Support Levi Hoffman by donating directly to the Southern Corroboree Frog.